We are considered as one of the most renowned Suppliers of Brass Metal Sheets in the country. Our Brass Sheets are the blend of high technology and optimum quality raw materials. These sheets are made available with us in various technical specifications as per the requirements of the clients. High tensile strength, consistent performance, and durability are some of the essential features of our Perforated Brass Sheet. They are high on demand for the development of eyelets, switches, radiators, connectors, cartridges, relays, taps, fancy toilet fittings, cold press work, deep drawing and general stampings. In addition to the above facts, we offer Flat Brass Sheets at the most discounted rates. 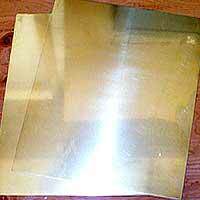 We are a reputable Brass Sheets Manufacturer, offering a diverse range for various industries. Made available in standard assortments, the Brass Sheets can also be manufactured by as per clientsâ�� requirements. Each Brass Sheet is made from high grade alloys to give more durability and excellent mechanical properties. Leaded sheets are also manufactured by us that are suitable for fine machining.